• 1,050+/- Acres offered in 21 Tracts • Ranging from 14+/- to 190+/- acres • Plus a 450+/- acre Hunting Lease • Pristine Ponds, Scenic Views • Prime Hunting/Recreational Areas • Mixture of Hardwoods & White Pines • Hay Fields/Meadows • Numerous Trails & Interior Roads • Excellent Wildlife Habitat • Create your own Rural Estates. • Online Bidding Available. 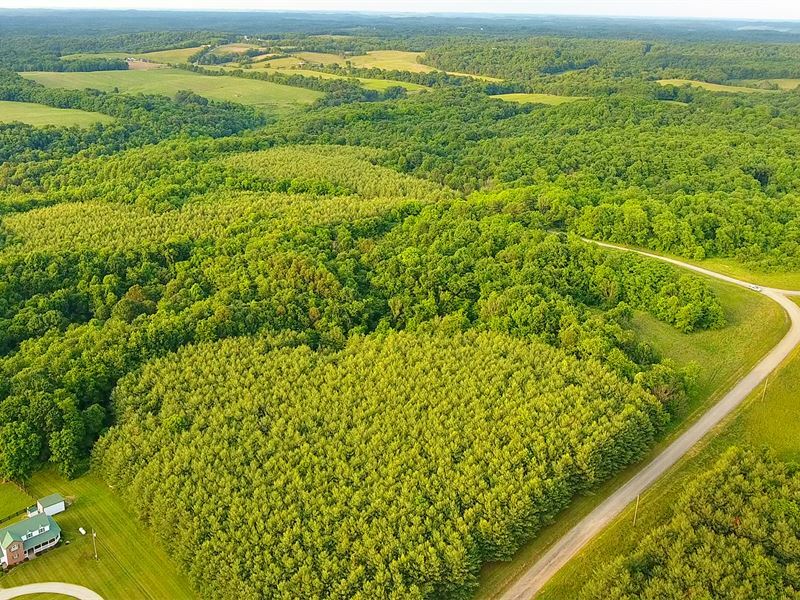 On Saturday, August 18, Schrader Auction Company/Murray Wise & Associates have the privilege of offering 1,050+/- acres of timber land in Muskingum County, Ohio at auction. This property will be offered in 21 tracts ranging from 14+/- to 190+/- acres plus a 450+/- acre hunting lease with the opportunity for the buyer to design the purchase that best fits their dream property. The property will be offered in individual tracts and any combination of tracts depending on the buyers personal preference. This property features mixed hardwood/pine trees, meandering streams, scenic ponds, numerous trails and meadow areas creating an excellent wildlife habitat. For the hunting enthusiast this is a great opportunity to purchase a diversified property with good wildlife habitat in one of the top deer hunting counties in the state of Ohio. Tract 1: 16± ac with frontage on Fairview Church Road featuring 5+/- acres of 20 year old White Pine Trees with the balance of acreage in mixed hardwood trees. Tract 2: 14± ac with frontage on Fairview Church Road and Symmes Creek Road featuring mature mixed hardwood trees. Great frontage with easy access from two roadways. Tract 3: 17± ac with frontage on Fairview Church Road and Symmes Creek Road with 4+/- acres of 20 year old white pine trees balance of acreage consists of several acres of open meadow area and mixed hardwood trees. Tract 4: 20± ac with frontage on Symmes Creek Road 6+/- acres of 20 year old plantation planted White Pine Trees balance of acreage in mixed hardwood trees. Tract 6: 73± ac with frontage on Symmes Creek Road. This property features 7+/- acres of 20 year old White Pine Trees adjacent to Symmes Creek Road creating a potential serene building site with balance of acreage in mixed hardware trees. Combine Tracts 5 & 6 for a great potential recreational/hunting area.